Torrential overnight downpour threw normal life out of gear in several parts of the metropolis and neighbouring districts, even as the Marina Beach locality recorded a whopping 30 cm of rain. Schools and colleges, closed since October 31, remained shut in Chennai, Tiruvallur and Kancheepuram districts, as the Tamil Nadu government appealed to private firms to allow their employees work from home. There was no rain in the city since morning, though the sky remained largely overcast. In a fresh rain-related incident, a middle-aged farmer was electrocuted at Manal agaram near Tiruvarur when he stepped on a snapped live wire lying under water in his field, police said. Thus, toll of rain-related incidents in the southern state since the arrival of north east monsoon on October 27, has risen to eight. 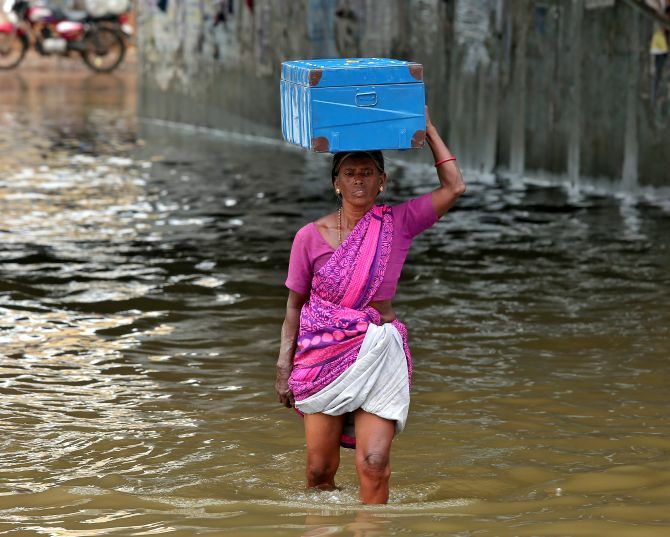 As the heavy spell led to fears of a repeat of the December 2015 deluge, the All India Anna Dravida Munnetra Kazhagam government sought to allay any such fears. It asked people not to pay heed to rumours on social media that many lakes and reservoirs around the city were about to surplus and that the water would be let out. “Do not spread and believe in rumours #work from home and 3rd Nov leave is 2 avoid traffic jams nd to avoid any untoward incident” said a tweet by the Tamil Nadu State Disaster Management agency. As the monsoon remains vigorous, most parts of the city and suburbs received heavy rains on Thursday night, with the director general of police’s office near Marina beach recording a maximum of 30 cm in 24 hours ending 8.30 am on Friday. The famous Marina beachfront and service lanes were under a vast sheet of water, presenting the picture of an extended sea. 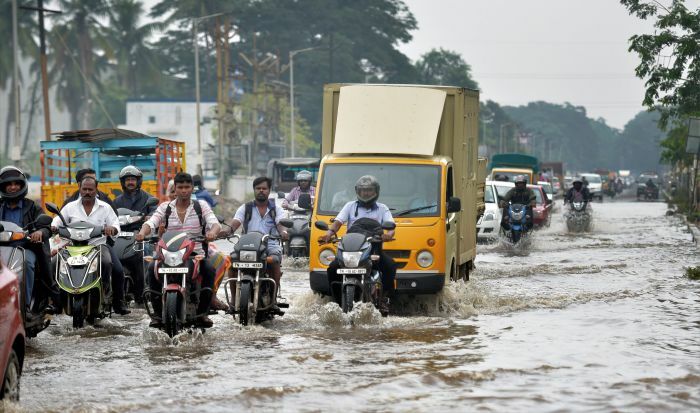 The coastal district of Nagapattinam continued to suffer monsoon fury, with incessant rains submerging houses and affecting standing crops over thousands of hectares. The regional weather office has forecast heavy to very heavy rains in the coastal districts, and thunderstorms in Chennai and its suburbs for the next 24 hours. 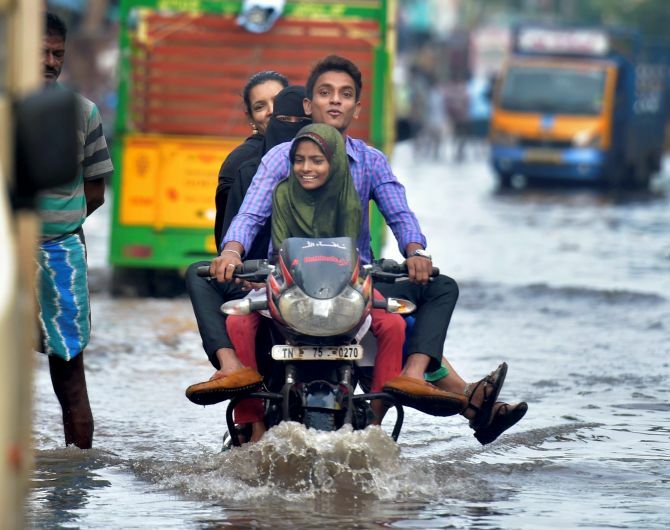 “For the next 24 hours, there will be heavy rains in some places and very heavy rains in one or two places in coastal districts,” S Balachandran, Director, Area Cyclone Warning Centre, told reporters. There will be spells of thunderstorms in Chennai and its suburbs, he said. Anna University and University of Madras announced cancellation of their semester exams. Chief Minister K Palaniswami, accompanied by some senior ministerial colleagues, visited a few affected areas, including R K Nagar. The incessant downpour also crippled life in suburban Mudichur, one of the worst affected areas in the 2015 December deluge, as heavy water-logging of roads and inundation of low-lying areas was reported. Residents of the area under Kancheepuram district expressed fears of a repeat of the 2015 deluge, when many of them had left homes for safer pastures. Some of the residents also staged a protest by squatting on the water-logged Mudichur Road, demanding immediate action. 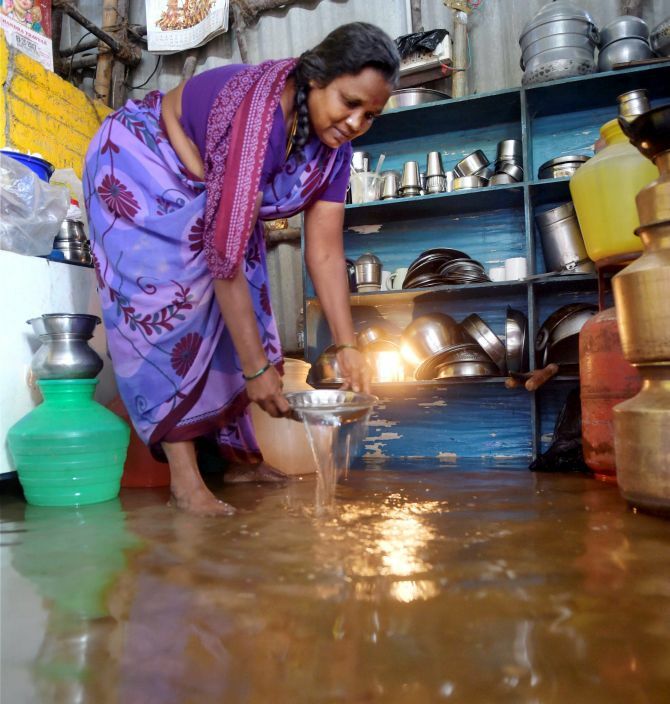 Areas like Vyasarpadi and Otteri in north Chennai, parts of West Anna Nagar in central Chennai and Madipakkam and Velachery in south Chennai are facing heavy water-logging. Civic officials said efforts were on to clear waterlogging. 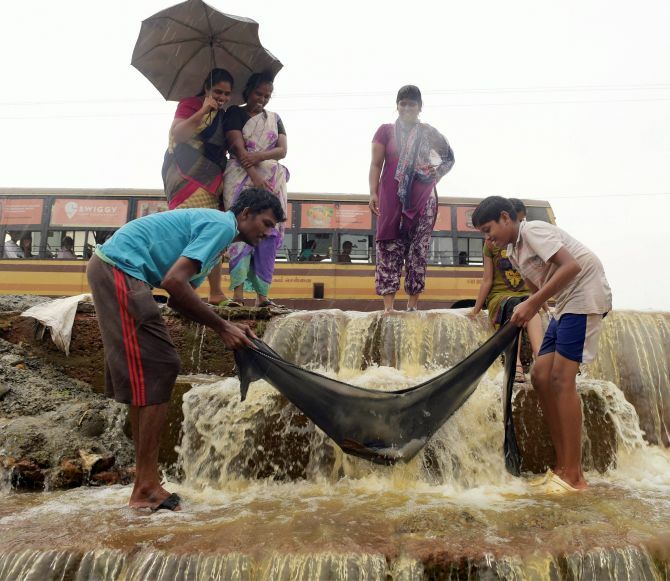 The mild and intermittent showers post-noon on Thursday became moderate and then heavy in some pockets on Thursday night, inundating several more neighbourhoods including West Mambalam and the Guindy Industrial Estate, the MeT said. As a result, buses, taxis, autos and suburban train services were affected, leading to traffic snarls in many places. While heavy waterlogging hindered free vehicular movement, a “signalling snag” partially hit train services between St Thomas Mount and Kodambakkam suburban section since 9.30 pm on Thursday. Normal services, however, were restored at 3.20 am on Friday, railway officials said, adding there were no major disruption in services on all sectors. Flight operations at the city airport were normal, airport officials said. The Nungambakkam weather station in the city registered 18 cm rain and Meenambakkam in the southern suburb recorded 14 cm rain till 8.30 am on Friday. Parangipettai in Cuddalore recorded 14 cm rain. 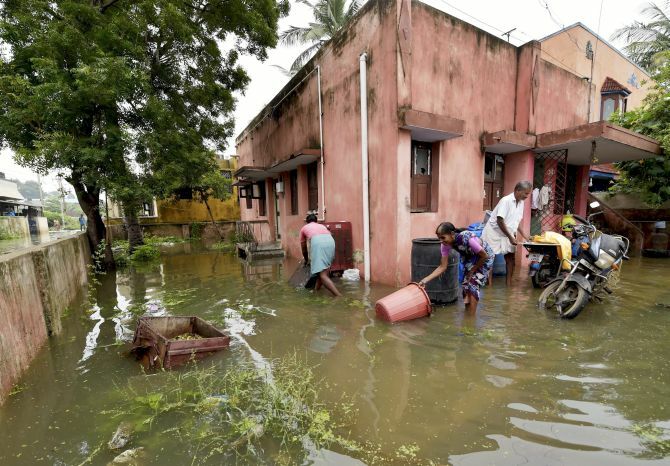 A Nagapattinam report said heavy rains lashed parts of the district for the fifth day on Friday, inundating hundreds of houses and submerging thousands of hectares of paddy crops. People were evacuated to safety in Tarangambadi and Sirkazhi taluks, which bore the brunt of the monsoon fury. At Tarangambadi, Dansborg, the 400-year old fort built by the Danish on the seafront, is surrounded by water. Accompanied by Nagapattinam District Collector C Sureshkumar, Tamil Nadu Handlooms Minister O S Manian visited many rain-hit areas in the district and inspected the relief work. The sea remained very rough, with waves rising to several feet. More than 10,000 fishermen did not put out to sea for the fifth day, official reports noted. Salt production in Vedaranyam area came to a standstill as saltpans in 10,000 acres of land remain submerged. Samba and Thalady paddy raised in over 75,000 hectares of the total 1.28 lakh hectares, remain submerged in the district, the reports added.